The download of Resolume will work in demo mode straight away. You will notice that occasionally the Resolume logo will appear on the video output and a robotic voice will remind you what software you are using. This is the only limitation of the demo. You can use every feature and try all the things Resolume has to offer. In order to get out of demo mode and use Resolume for real, you can buy a license from our webshop. When you have done that, you will receive a serial number. 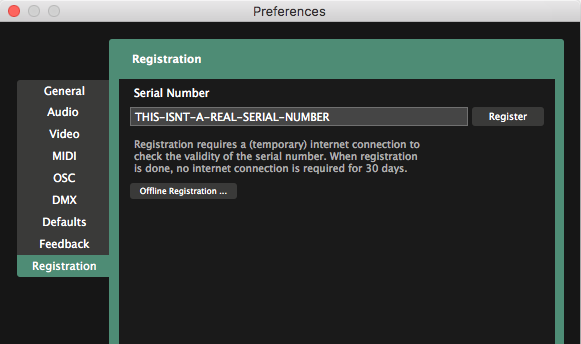 Once you have a serial number, select File > Preferences in Resolume and click the Registration tab. Enter your serial number into the text box and click 'Register'. 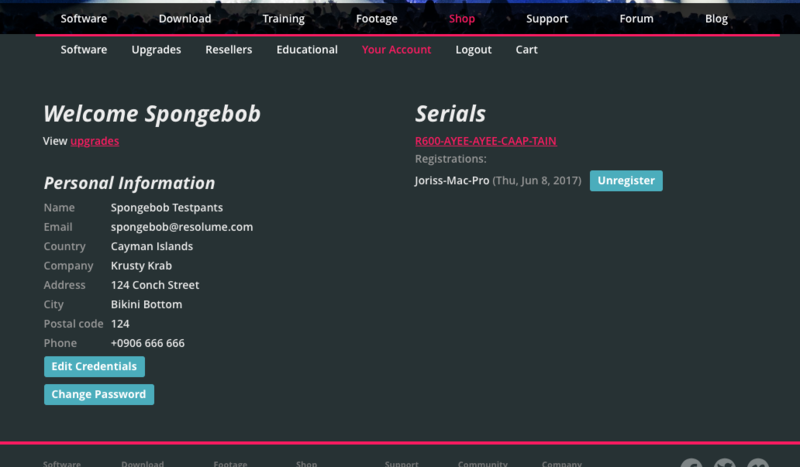 Resolume will now use your Internet connection to confirm your serial number. Once this is completed, Resolume will be fully registered. The audio and video reminders will be gone. Resolume will occasionally need to check if everything is still in order. It does this automatically every time you run Resolume on a computer with a working Internet connection. You won't even notice it. 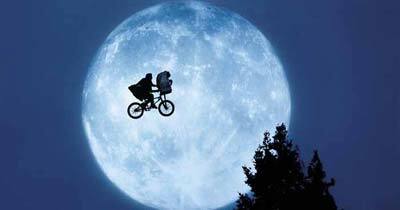 If you run Resolume on an offline computer, it will remind you to phone home once every 30 days. You can register Resolume without having an Internet connection on the machine you install it on. You will need to enter your serial number and the ID Code that you just noted. The Resolume website will then generate a registration key file. Transfer this file to the computer that you have installed Resolume on. 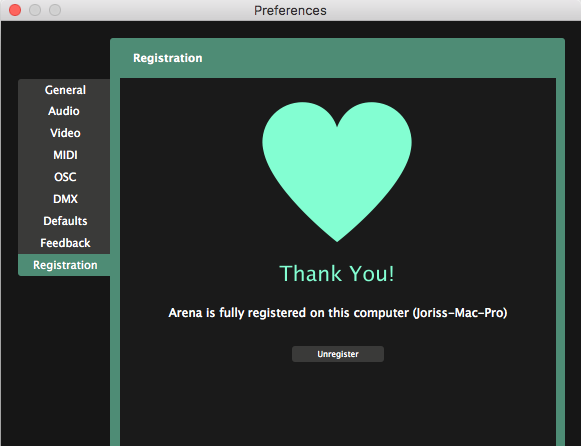 Now select File > Preferences in Resolume and click the Registration tab. Click the 'Offline Registration...' button and then the 'Load registration file...' button. Select the file and Resolume will become fully registered. When you need to re-install your operating system or when you have bought a new computer, make sure you remove your registration. To remove your Resolume registration from a computer, go to the Register tab in the Preferences and click on the "Unregister" button. This will remove your serial number from the computer. Sometimes computers get stolen or damaged. Also, we're all humans and sometimes we tend to forget things. When stuff happens, don't worry. You can still use Resolume. Just log in to your account in the shop to remove your Resolume license from the lost computer, and you'll be good to go. A multi-seat license will come with a single serial. This serial can be used to have more computers registered at the same time. So a Resolume license for 3 computers will come with a single serial. That serial can then be used to keep 3 computers registered simultaneously. Similarly, when upgrading from Resolume for 1 computers to 2 or more, your serial number will be 'expanded' to be valid on 2 or more computers. It is not possible to split the license into several serial numbers. Every Resolume 6 license gets one additional backup. You can use it to always have a second computer registered and standing by. Or you can use it to register both your home studio render beast and use the backup for your live laptop. Or you can keep your second install unused and ready to go when your first computer catches fire. Whatever you prefer. The ever important small print: when upgrading to a multi-seat license, you still get 1 backup. So if you have Resolume for 2 computers, you can install it on 2 computers + 1 backup. Then on to 3 computers + 1 backup. Then 4 computers + 1 backup. Etc etc. You see where this is going. We all watched Sesame Street when we were kids, so you know how Count Count counts. The backup is there to tie you over in case of emergency. If your shows are that important that you need full redundancy, for all your machines, all the time, we kindly ask you to purchase a license for the required amount of computers.